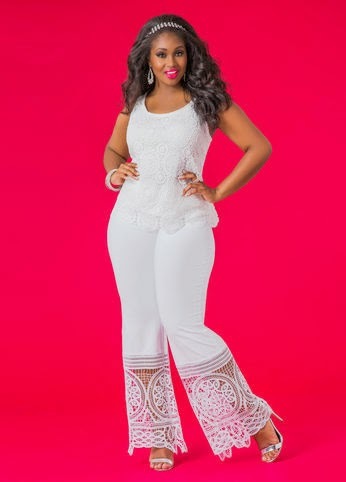 Ashely Stewart has some wonderful tops and pants on sale. In their Diva Dash! selections you can find items that are reduced by 30%. The following items are not only pretty but flowing in femininity. These Crochet Palazzo Pant are $25.55, and the Lined Crochet Tank are only $49.70. Don't they look adorable together. 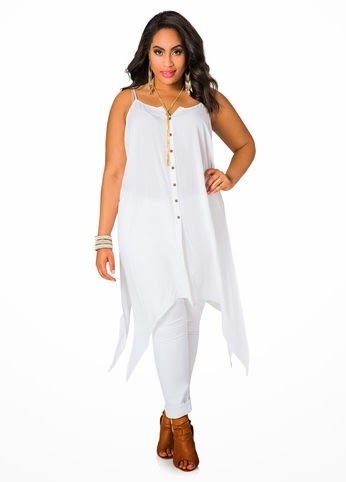 However, if mixing and matching is your thing, go for this angel wing hem Sharkbite Cami Duster for $24.15. As stated above, these three items are just a few items Ashley Stewart has to offer to heat of your summer. I found some wonderful dress sales at three popular online stores. 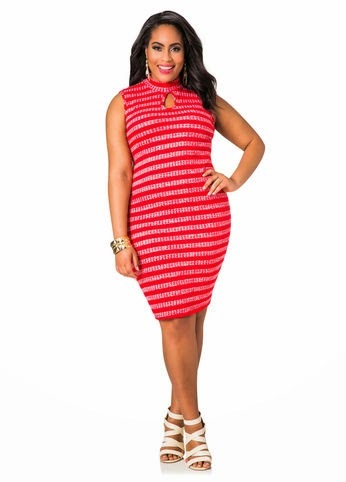 First, at Ashley Stewart we have this cute Stripe Knit Mockneck Dress at the sale price of only $44.50. The dress comes is sizes 1X, 2X, and 3X with two adorable colors: Barbados Cherry and Medieval Blue. Next we have an Envelope Hem Studded Dress with gold metal stud on the hems. This dress comes in the colors Fushia Red and Nuetra Taupe with in sizes 1X, 2X, and 3X. Asking price $54.50. 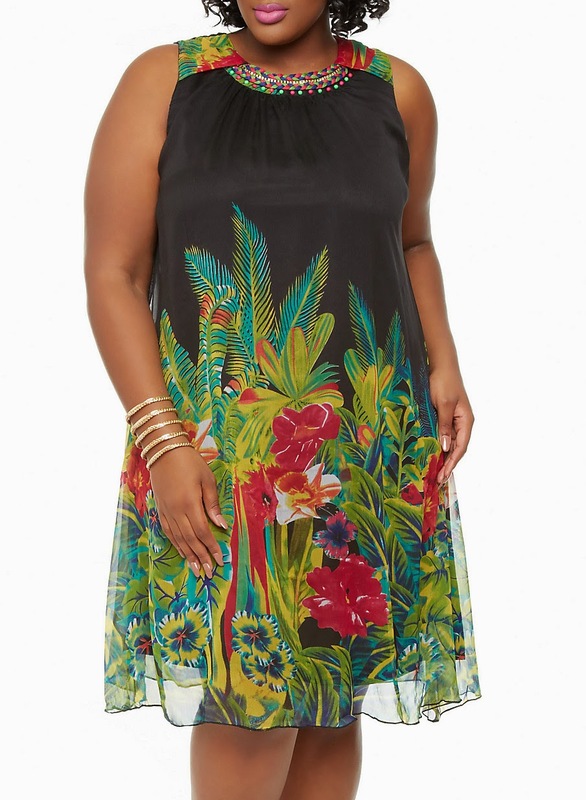 Now, we move on to Rainbow Shops.com and this first dress is a flowing exotic Ombre Tropical Print Dress with Embellished Neckline and is $19.99. Size 1X, 2X, and 3X. 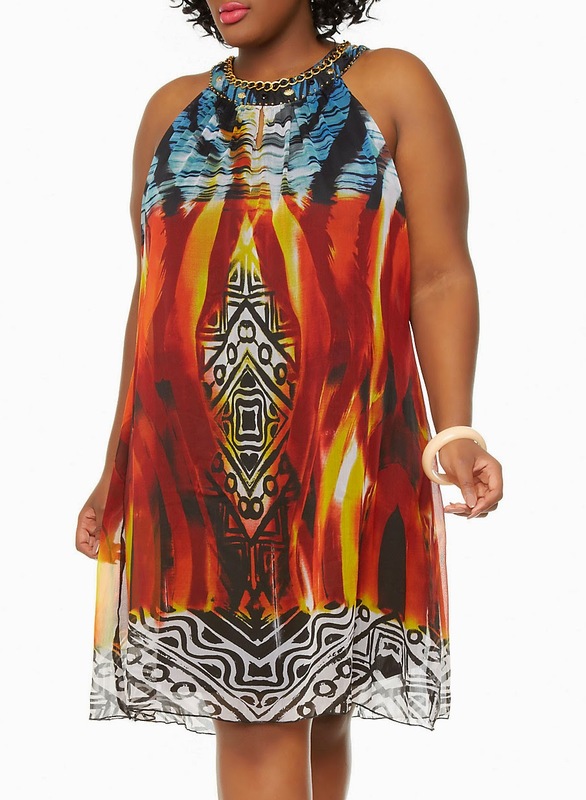 Then there is this Fire Tribal Print Halter Dress with Chain Metal Neckline. It too is a mere $19.99 and comes in sizes 1X, 2X, and 3X. Finally, from Macy is this Love Squared Plus Size Short-Sleeve Lace A-Line Dress. This cute little flowery lace dress is perfect for any social occasion and comes is sizes 1X, 2X, and 3X. The price is $38.99 and comes in seven unique colors. 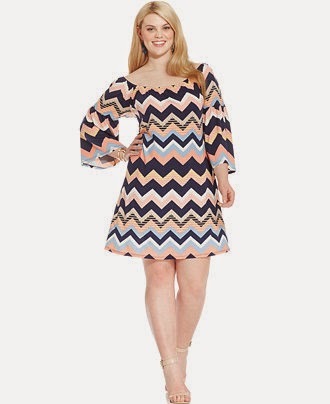 Concluding this small sample of amazing Memorial Day dress sales is this Macy’s Love Squared Plus Size Chevron-Print Peasant Dress in Navy/Coral for the selling price of $36.99 and sizes 1x 2x 3x. For more information on any or all of these dresses click their links.